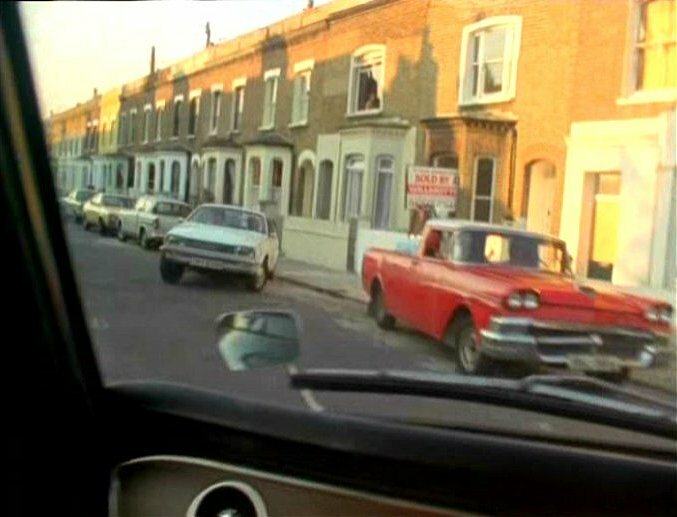 IMCDb.org: 1958 Ford Unknown Custom-made tow truck in "The Sweeney, 1975-1978"
It has towing equipment ..but I wouldn't call it a tow-truck!? ...but the tail isn't right. 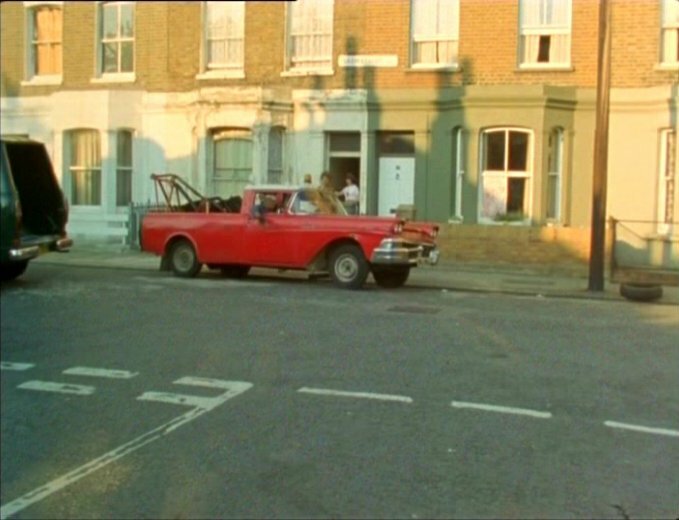 Could this be a cut-down panel van? tow truck was for the heavy tow trucks (like the one in Terminator 2). Light trucks like this one fall in the chassis-cab or pickup category. 1958 Ford Custom or Fairlane. Initially, a four door sedan. During the seventies, it was common to "convert" american cars in towing machines or whatever. I'm living in Geneva Switzerlanz and I remember well some of them. One of those was also a red '58 Ford Fairlane (not this one) that was in service for one of our local Junkyard... The best or the worst was a Facel Vega Excellence in usage by a Body Shop !!! I've heard of cases where people took Rancheroes and El Caminoes and converted them into tow trucks. And I'm talking about in the USA. This is a 1958 Ford Ranchero, BTW. 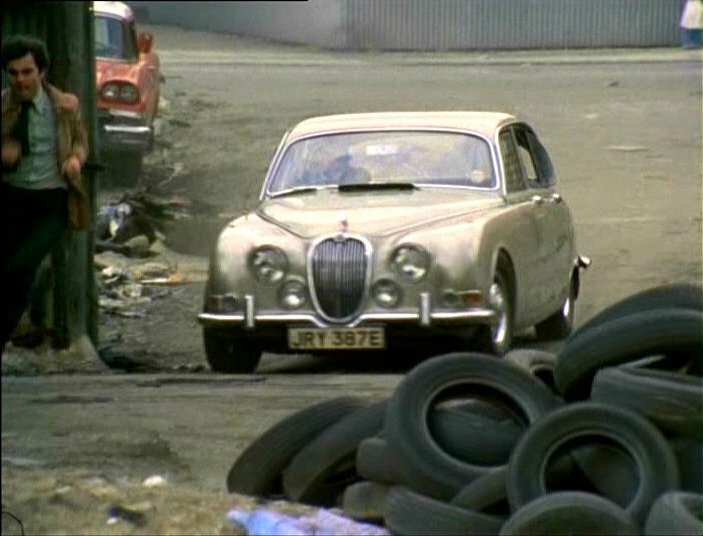 As this was imported (well, ok, registered) in the UK 1967, it's unlikely to have been converted earlier and shipped, most likely done here? A 'factory' Ranchero should have be sculpted towards the light fitting, this does not have this: www.carnut.com/cgi-bin/03/_image.pl?/show/03/fame/fame119.jpg. So where has the back come from? I think it would be safe labelling this one '1958 Ford', for now? I agree with zorglub. Looking at the length of the doors this was definitely a four door originally and NOT a Ranchero, Rancheros had longer doors like a two door coupe. So this was a 1958 Ford sedan or station wagon. The rear bodywork has obviously either come from a later vehicle, possibly a European van (Bedford CF??) or been scratchbuilt. 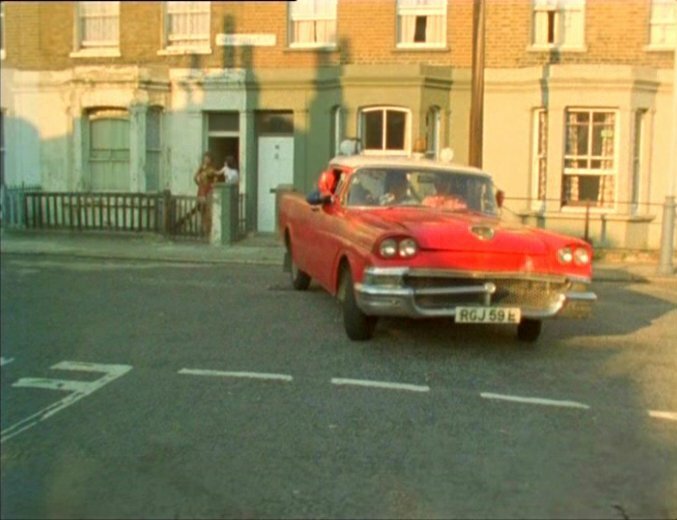 I've just seen this episode entitled 'IN From The Cold' Season 3, ep 2, and this is 1958 Ford is definitely NOT a Ranchero. It started life as a four door saloon or station wagon. 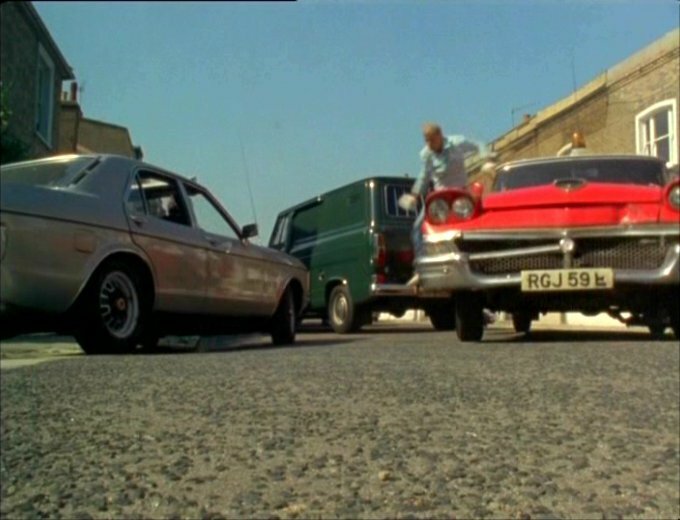 The rear bodywork is NOT from a Ford and it appears to have Austin tailights. Nothing on the DVLA Database for the vehicle with the registration; RGJ 59E. Did Australia ever made these 1958 Ford Utility? The Australian 1958 Ford still had the 1955-1956 US Ford body. Australian utes had a rear side window like a normal passenger car.